After Sales Services For any queries please contact Customer Service Number - 1800-425-8665 (Toll free) Brand Name Bosch Chuck Capacity 1.5 - 13 mm Contains 5 x Masonary drill bit 5 x Matel drill bit 4 x wood drill bit 1 x Claw hammer 10 x Screw driver Bit 1 x Combination Plier 1 x Adjustable Wrench 1 x Adjustable Knife 30 x Screws(3,4,5 mm) 30 x Fischer Nylon Fixing 7 x Socket 1 x Keyless Chuck 1 x Depth Stop 1 x Auxiliary Handle 7 x Socket(4,5,6,7,8,9,10 mm) Item Weight 1.7 kg Max. 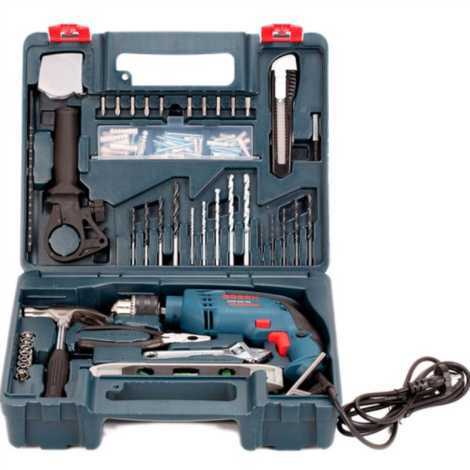 Impact Rate 0 - 44800 bpm Model Bosch 600 RE No Load Speed 0-2800 RPM Power Consumption 600 W Product Dimensions (LxBxH) 10 x 10 x 5 cm Torque 1.8 Nm TSIN T06BOS0272 Voltage 220 - 240 V Warranty 6 Months Warranty Terms & Conditions Valid only through seller/manufacturer; Tolexo is not liable for any warranty claims. Please read the usage manual available with the product to understand product usage and warranty T&C. Any other information regarding warranty can be obtained from brand website or by contacting seller.How to Claim Warranty 1. Please contact the Authorized service center of Brand (list available online) for claiming product warranty and service related issues. Key Features Forward / Reverse switch for screw driving work,Two way Hammering/drilling mode selector switch.